West Bengal Sub-Inspector of School Previous 2014 Question paper provided here. Most of the students search on Internet West Bengal School Sub-Inspector Exam previous year question Paper. But, they can't find proper question Paper. We solve this problem. Here, you can get all Competitive Exam Previous Year Question Paper. PSC Sub-Inspector of School Previous Year 2014 Question Paper Download. Today GK Solve share, West Bengal Sub-Inspector of School Previous Year 2014 question pdf download link. You should download this question paper right now. Previous year question paper helps you to better preparation. West Bengal School Of Sub-Inspector Exam, is very important for Bengal Students. 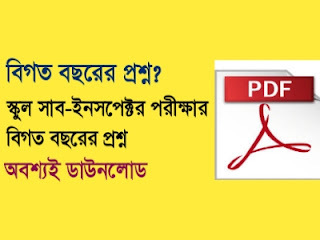 So you must download, PSC Sub-Inspector Of School previous 2014 Question Paper Download.